Moody's has become a downgrading machine. 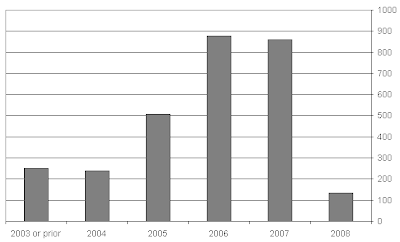 Just in the second quarter of 2009 alone, Moody's downgraded 510 CLO tranches from 93 transactions ($33 billion of paper). These are structured deals with mostly corporate loan collateral. 74% of the Aaa-rated (AAA) tranches that were on review got downgraded. Moody's is trying to compensate for it's destructive mistakes with AAA RMBS of years past. They are expecting to downgrade "a majority" of the CLO senior tranches by year-end. Looking at the vintage of the deals, as expected, the 06-07 deals are the most vulnerable. And here is the matrix showing credit migration life-to-date. Subordinated tranches have been hit the hardest, but the senior downgrades are coming in quickly. So what's been driving these downgrades? Here are some of the trends from Moody's. 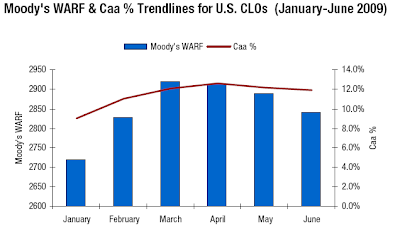 The chart below shows the weighted average rating factor (WARF) for CLOs with rapid escalation earlier in the year. Higher number means lower average rating, and at 2900 the CLO average rating is worse than B2. The collateral was rapidly getting downgraded earlier in the year, but in Q2 the managers started rotating into better credits, trying to improve their WARF. CLOs also have a limitation on their Caa (CCC) or below basket. Most are at 7-10%, and as the graph shows, most are violating their limit. This doesn't cause a default of the deal, but creates other nasty issues. The overage of the CCC basket is carried at market value rather than par (the bulk of the collateral in CLOs is carried at par), which creates problems when the market for loans tanks. The next graph shows the pace of defaults, which continues on it's upward march. This is what made Moody's really nervous, forcing them to quickly downgrade the subordinated tranches. As defaults and the CCC basket overages increased, the overcollateralization (OC - the amount of eligible collateral over the liabilities) had been dropping rapidly. As the OC hit certain triggers on it's way down, the deals were forced to trap net interest income cash, usually distributed to equity (and fees distributed to the manager - see CLO managers forced into bad behavior), and use that cash to pay down the senior liabilities. 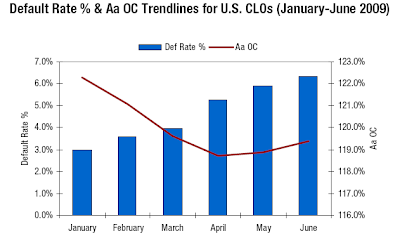 That cash along with the recent rally in bank debt helped reduce some of that OC pressure, as the average OC has begun to stabilize. Even with high default rates on the collateral, it's highly unlikely many CLOs will experience an "event of default" and be forced to liquidate collateral. These transactions are much more stable than the CDOs with RMBS collateral. Of course to Moody's that's all not very relevant. They are on a war path to repair their tarnished image, and the motto these days is - downgrade first, ask questions later.